Online Registration opens on January 1st, 2019! Join us for the 2nd Annual Historic Germantown 8K on August 3rd, 2019 at Veterans Memorial Park in Germantown, Ohio! We’re kicking off Founder’s Day in Germantown, Ohio with a scenic and fast 8K along with a 1K Kid’s Fun Run. Excellent selection of post-race food including Bill’s Donuts, Clif Bars, and much more! Handmade in the USA wooden awards for Overall, Masters, and Age Group winners three deep. One step closer to earning the coveted Ohio medallion for completing the Miami Valley Race Series! And of course we will let you pig out on post-race food too! Our races are directed by the Miami Valley’s only RRCA Certified Race Director. We strive to produce professional events and act ethically and transparently as is required of all RRCA Certified Race Directors. 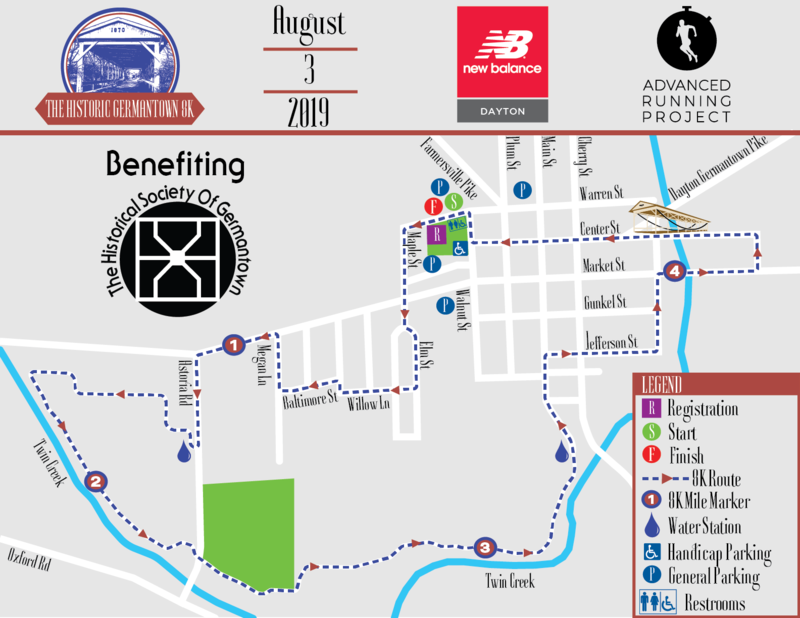 What events will the 2019 Historic Germantown 8K presented by New Balance Dayton offer? How do I register my child for the Kid’s Run presented by Dayton Children's Hospital? What is the age limit on the Kid's Run presented by Dayton Children's Hospital? What is the Miami Valley Race Series? Are there overall awards for the entire series? Are walkers allowed to participate and are there time limits? May I use an iPod or other device for music? What is the address of the event venue for parking, packet pickup and the race start/finish? Where do I pick up my bib number and race packet? Can a friend pick up my Participant Race Packet? Can I register on race weekend? What if I am not able to participate, are there refunds or deferrals available? What type of timing system is the event using? Are there any age minimums? Are baby joggers, strollers, roller blades, dogs or bicycles allowed in any event? May I exchange my event shirt for a different size at Packet Pickup? What kind of weather should I expect at this event? What is the course elevation and terrain like? Does the race have medical support? Are there finisher and/or age group awards? What time is the award ceremony? How do you all handle dopers, cheaters, etc? Does this race support any causes? Do you offer family or group discounts? Do you offer discounts for runners 18 and under? Do you offer discounts for members of Ohio River Road Runners Club? The Historic Germantown 8K presented by New Balance Dayton is comprised of a 8K and a 1K Kid’s Fun Run presented by Dayton Children’s Hospital. All events will take place on Saturday 3 August 2019. 8K Run – 7:30 a.m. Kids Race – 8:15 a.m.
Children can be registered online before the event or race day at packet pickup. While there is no firm age maximum, we generally encourage children over the age of 12 to participate in the 8K. The Miami Valley Race Series is comprised of three premiere races including the Crossroads 5K on June 8th in Vandalia, Ohio, the Historic Germantown 8K, and the Gem City Classic 15K on October 12th in downtown Dayton. 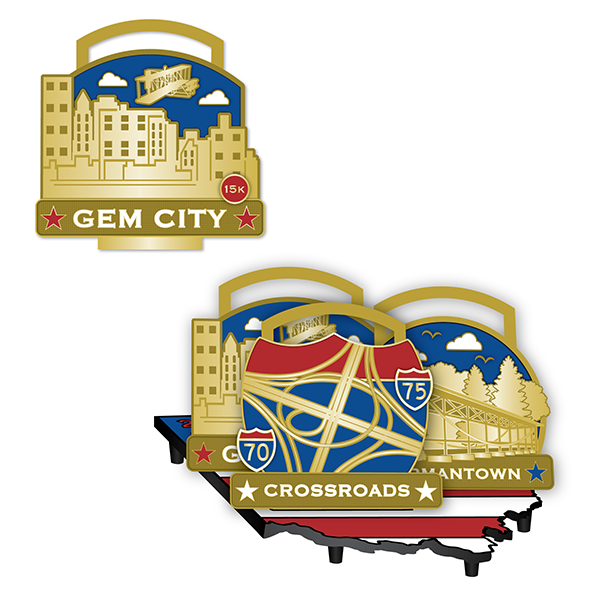 Runners who complete all three races in the series will earn a unique and beautiful medallion in the shape of Ohio which holds the finisher medals earned throughout the series. While there are no awards for the entire series, series total times and places will be posted in the final results. All events are walker-friendly. With an 7:30 a.m. start, the 8K course has a maximum course time of 1 hour and 30 minutes or until 9:00 a.m. Any runner/walker that fails to maintain the minimum pace will be asked to move onto the sidewalks to facilitate opening the roads on time. The finish line will officially close at 9:00 a.m.
iPods or other music devices are allowed but we ask that you stay safe and aware by keeping volumes at a low level in case of emergency. Rule 144.3 of USA Track and Field enables race directors to choose to allow the use of headphones by runners in non-championship races. At this time we have chosen to allow runners to be able to compete with headphones in. There will be two packet pickups. We strongly encourage runners to pick up their packets the night before. Yes. The person picking up the packet on your behalf must bring your email confirmation to packet pickup. Absolutely! One can register at packet pickup from 6:00 a.m. to 7:30 a.m. on Saturday August 3rd at Veterans Memorial Park – 190 W Warren St, Germantown, Ohio. No. We do not allow the transfer of registrations. While there are no refunds, we do allow deferrals in emergency situations. Simply email info@advancedrunning.com prior to the event taking place notifying us of your intent to defer. When registration opens for the following year, you will need to email us again with a copy of the original email as proof. The Historic Germantown 8K has partnered with Speedy Feet, the leading event timer in southwest Ohio to provide chip timing. Runners will have a disposable timing chip on the backside of their bib and will not have to do anything in order to get 100% accurate results! While we have no age minimums, we encourage parents of young children to run alongside them during the event to create a safe and memorable family experience for all. Additionally, all those under the age of 18 must have a parental waiver signed. Baby joggers and strollers are permitted but we ask that you start at the back of the field. Roller blades, skateboards, bicycles or any other wheeled devices are not allowed. Further, USATF does not allow dogs on the course. Yes! If the shirt you doesn’t fit the way you like, you can exchange on the spot at Packet Pickup! No there will not. We encourage participants to securely store your gear in a locked vehicle during the event. On average in early August one should expect more humid conditions and a temperature in the mid 60s to low 70s. However these are merely averages and weather can change any given day. We will update participants on what to expect in the 48 hour window before the race. This USATF certified 8K is a fast one. The course is flat and makes a counterclockwise loop around Germantown. Beginning by head west towards the Twin Creek Trail, runners will enter onto the path in the 2nd mile and travel along Twin Creek. In the 4th mile runners re-emerge back into Germantown where they will pass by beautiful historic homes on Main St. The 5th and final mile has runners passing through the Historic Germantown Covered Bridge and racing back to Veterans Memorial Park via the heart of Downtown Germantown, a National Historic Place. It sure is. The USATF Certification # will be provided approximately 1 month before the event. Yes! Around 1.5 and 3.5 miles there will be an aid station with water at each location. Make sure to thank the volunteers for spending their Saturday morning helping with the event! Yes! 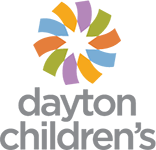 Dayton Children’s Hospital will be onsite with trained staff to deal with any medical issues that arise during the event! 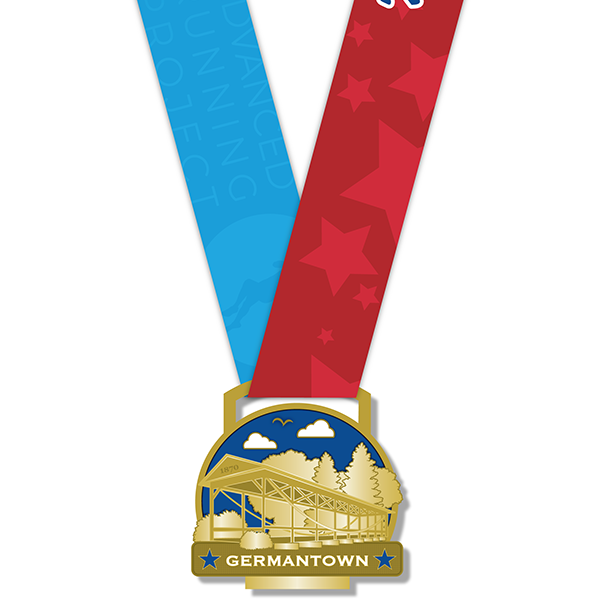 All runners will receive a beautiful finisher medal with a custom ribbon designed by Ashworth Awards. We aren’t leaving out the children either, every kid who finishes the kids runs will receive a finisher medal too! Runners who place top 3 overall, top 3 in the masters division, or top 3 in any age group will receive a handmade in the USA wooden award designed and made by our friends at Elevation Culture, trust us, it’s worth it to run fast to get one of these! The award ceremony will take place roughly around 8:45 a.m. If you miss the award ceremony but receive an award, you can pick up your award after the event at your leisure at New Balance Dayton. The Advanced Running Project stands firmly behind all participants who train with integrity and in order to support the overwhelming majority of runners and walkers who participate in our sport fairly, we have a very strict policy in regards to all dopers, cheaters, liars, etc. If we find that a registered participant has been found guilty of doping, has been caught cheating, or has been caught lying about their age or home of record in an attempt to win an award within the past 10 years, they will be permanently banned from all future races and their names removed from our results. Further, we will contact all race directors and running clubs both local and in neighboring states as well as local, regional, and national governing bodies of the sport making them aware of such violations. We take these issues very seriously and will address them on a case by case basis as we are made aware of any rule breaking at our events. 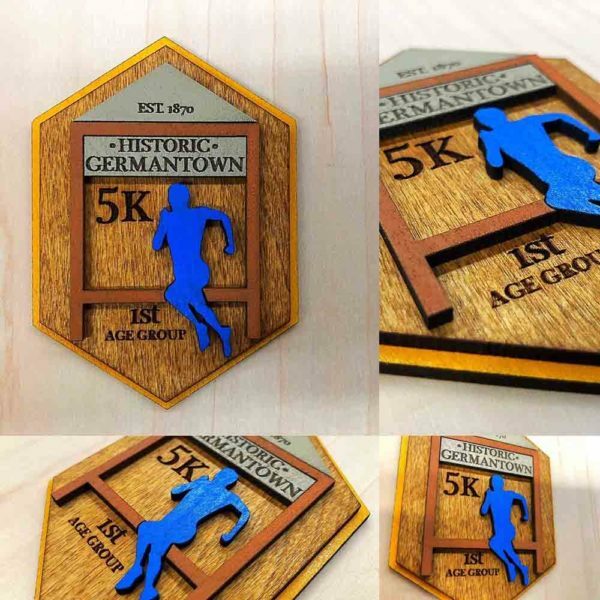 The race has partnered with the Historical Society of Germantown who will receive a portion of proceeds to further their work in preserving the rich history of Germantown. You bet! Groups of 4-6 get $3.50 off per registration and groups of 7 or more get $5 off per registration. 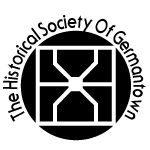 No discount codes required, our registration partner handles the pricing automatically when you register a group of 4 or more. We certainly do! Runners 18 and under always get $10 off what ever the current registration price is. No discount codes required, simply enter the birth date of the runner and our registration partner will add in the discount. We absolutely do! When you register using the same account as you did for your ORRRC membership, you will receive 15% off your race entry. This discount does not apply to virtual entries or kid’s runs.